With EZ Moves just lift, place, and slide. The EZ Moves furniture lifter system gives you up to 10x your natural strength. Simple to use just slide the EZ Moves right into place so that your furniture simply glides across any surface. Then they slide right out when you're done. Clean in all those dark, dreary, hidden places, or and you can rearrange rooms to design new spaces. The EZ Moves lifter is great for adjusting and leveling appliances. The rubber tip protects your furniture and the ergonomic design saves your back. Moving has never been so simple. You can do so much with EZ Moves, like move and adjust appliances, move furniture and dust underneath big furniture and hidden spaces. Lift ten time your weight with the EZ Moves System. Glide across just about any surface. Lift up to 2600 pounds. Half time, drip, flip, drive and be done in half the time. Do you home projects take forever? Do you want to speed up time? Check out Half Time Drill Driver it helps you to get the work done in half the time. We all know time is money and switching back and forth between drill bits and driver heads takes even longer. 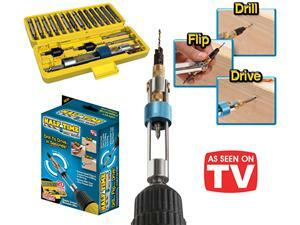 With the Half Time Drill Driver it has a new way to drill, flip and drive in only 5 seconds, that's amazing. You will never have to change a bit in the middle of a job again! Half Time works with the tools you already have. Saving you money having to replace your existing tools and plus making them better than before. You can go from drilling to driving, philips to flat, just about any combination for any task. The Half Time Drill Driver is one amazing professional tool. The half time drill driver includes 8x phillip head adapters, 8x flat head adapters and also 8x drill bits! The new doh harness that combines both comfort and control. It is available in 4 sizes, small, medium, large and extra large. Fits chest sizes as small as 15.5". The comfy control harness is easily adjustable, customizes in seconds, no chocking of the neck and it has an air flow mesh design. The comfy control harness is so easy to use just slip around the body, adjust it for comfort and control then easily attach matching leash. The comfy control harness can even fit smaller dogs like Yorkshire Terriers, Shih-tsu'z, Pug, Boston Terrier, Cocker Spaniel, Corgi and even a Jack Russel. Make walk time more enjoyable for you and your pet. Chock control can be painful and cause injury. You don't want that and neither does your furry companion. The Comfy Control Harness can send control signals to the chest and body and does not hurt the neck. So now you and your dog can enjoy an easy controlled, comfortable walks together. Bake pop mini cakes on a stick or so easy and quick to make. You can decorate each one in a different way. The small simple snack you are sure to love. Making bake pops would make for a fun activity at a Birthday Party. Each guest could bake their own tasty treat. You can use any type of cake mix. Instead of a boring snack, create your own beautiful great tasting mini cake pop. Make these delicious bite size treats right in your own home. Cake lollipops each one unique. Make holiday pops, animal pops and even ice cream pops.